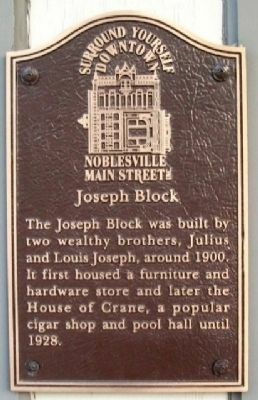 The Joseph Block was built by two wealthy brothers, Julius and Louis Joseph, around 1900. 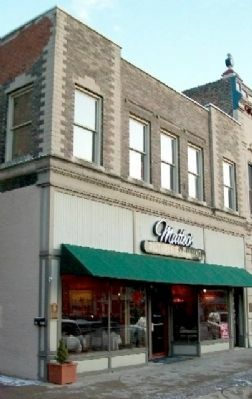 It first housed a furniture and hardware store and later the House of Crane, a popular cigar shop and pool hall until 1928. Erected by Noblesville Main Street, Inc. Location. 40° 2.763′ N, 86° 0.802′ W. Marker is in Noblesville, Indiana, in Hamilton County. Marker is on 9th Street, on the right when traveling north. Touch for map. Marker is between Connor and Logan Streets, on the east courthouse square. Marker is at or near this postal address: 40 N. 9th Street, Noblesville IN 46060, United States of America. Touch for directions. (within shouting distance of this marker); Heylmann Repository (within shouting distance of this marker); Corner Drug Store (within shouting distance of this marker). Touch for a list and map of all markers in Noblesville. More. Search the internet for Joseph Block. Credits. This page was last revised on June 16, 2016. This page originally submitted on February 23, 2010, by William Fischer, Jr. of Scranton, Pennsylvania. This page has been viewed 692 times since then and 12 times this year. Photos: 1, 2. submitted on February 23, 2010, by William Fischer, Jr. of Scranton, Pennsylvania.